If you're looking for a very affordable and branded Home Theater System in a Box for your dorm room or loft which has a good sound quality, then the Panasonic SC-HT40 will probably be the right choice. The Panasonic SC-HT40 only cost less than $200 dollars but delivers good sounds if you're going to use it in a small room. The Panasonic SC-HT40 consists of an AV receiver, right and left channel speakers, satellite speakers, center channel speakers, and subwoofer speakers. 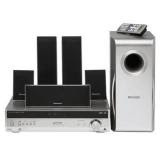 The Panasonic SC-HT40 has a total of 800 watts output and 5.1 Channel Surround Sound. There's no DVD included with the Panasonic SC-HT40 which is probably a plus for those who already own a DVD player. The Panasonic SC-HT40 has built in DTS, Dolby Digital, and Dolby Pro Logic II audio decoders, since the Panasonic SC-HT40 is only under $200, input options is pretty limited. You will get two analog stereo inputs, one analog stereo output, a coaxial digital input, three digital inputs and two optical digital inputs. There's also no video inputs and outputs so you're limited to using your TV for your video connections. The set-up is pretty simple, you don't need to be a rocket scientist to set-up the Panasonic SC-HT40.